New report: Is the EU on target to meet its climate change commitments? A new report from the European Environment Agency, European Community and Member States greenhouse gas emission trends 1990-1998, evaluates progress towards meeting commitments under the Climate Change Convention and Kyoto Protocol. In 1998, the European Union as a whole was only slightly off target. However, actually achieving the targets for 2008-2012 will require major efforts, as Gross Domestic Product (GDP) and energy consumption are expected to grow in the coming years. 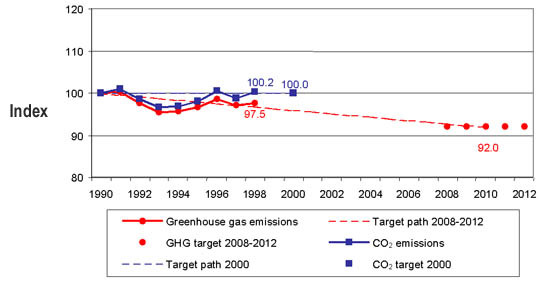 Emission trends are shown in the figure below. Note: See full report for further explanation. The report also assesses progress in the individual Member States, and for the different sectors and greenhouse gases. The following table gives an assessment of progress at Member State level. Only in Germany, Luxembourg and the UK have emissions been reduced substantially. These reductions are mainly due to increased energy efficiency and the economic restructuring of the new Lander in Germany and the switch from coal to gas in the UK. The report provides a timely input into the negotiations on the implementation of the Kyoto Protocol that start in The Hague next week. For references, please go to https://www.eea.europa.eu/highlights/Ann979227586 or scan the QR code.